When around 12.5 lac families were directly and indirectly affected by the floods, loss of property was estimated to be around a crore. As per the assessment and observation of AMAN’s field team during the course of immediate flood relief intervention activities, thousands of families lost their residential houses in the flood. 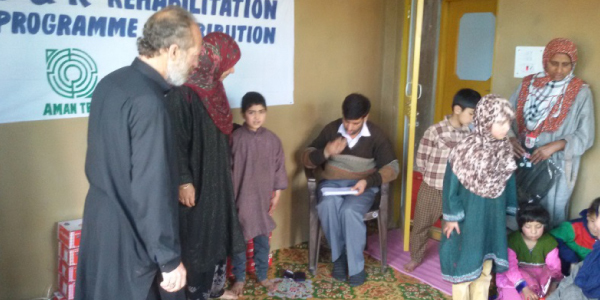 While rehabilitation related intervention focused on providing support to the economically marginalised flood affected families, AMAN with generous support from Charity Aids Foundation (CAF) provided basic support to children of these families falling in the age group of 5 to 18 years. Relief materials like- school bag, pheren (Kashmiri overcoat), shoes and socks were distributed to 49 children across the districts of Srinagar, Budgam and Pulwama.